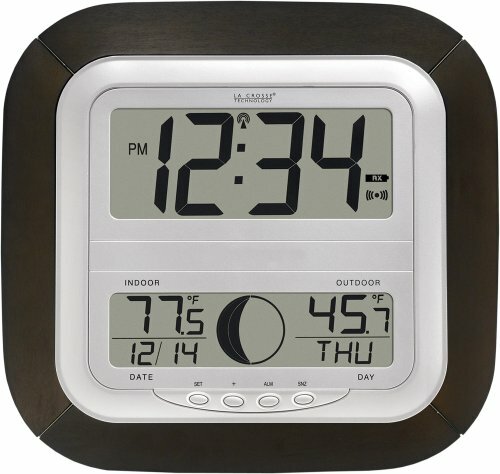 Stylish atomic digital clock is packed with many features and offers modern look to add to your living room or kitchen. 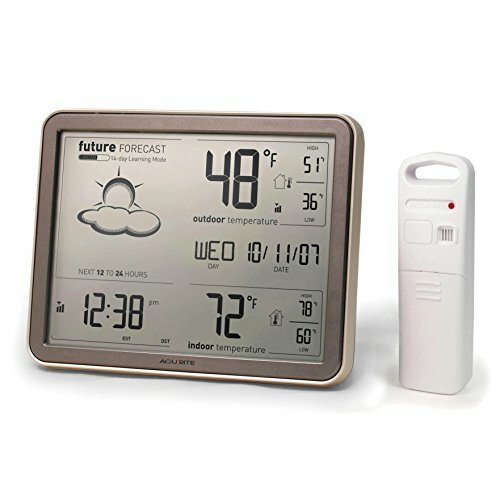 Outdoor temperature display receives wireless data from weather-resistant transmitting sensor within a 300 ft (91 M) range, down to -40 F. Large, 2 inch tall time digits set automatically to your time zone selection and adjust to daylight savings, all on an easy to read LCD with calendar display & moon phase. 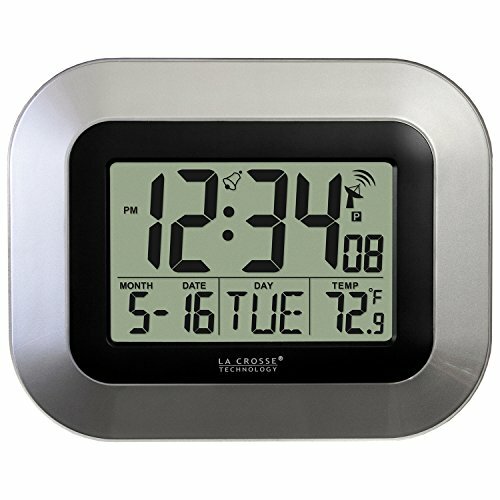 Clock indicates active alarm, WWVB signal, and low/weak battery with adjustable display language. Mount clock onto wall or fold-out leg stand to place on table. There is an error in the DST ON/OFF mode setting. All States except Arizona must set the DST mode to OFF. 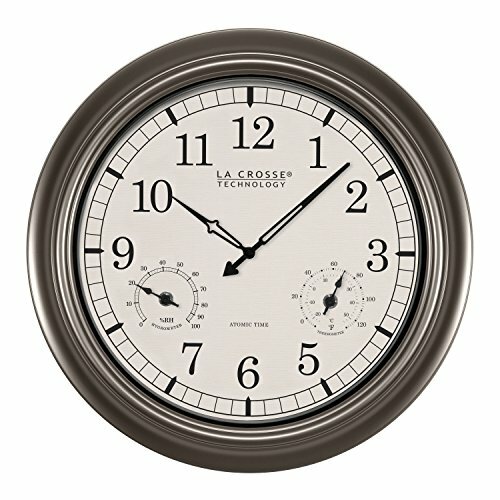 Due to a software omission, if the NIST adds a leap second (https://en.wikipedia.org/wiki/Leap_second) in December, your clock will be one hour fast during the month and will resume to normal time January. If this happens, you can correct the time by setting the DST mode to OFF for the Month of December. Then turn DST mode back ON in January. Weather the day with confidence with your own weather and weather prediction information, offering pinpoint accuracy right from your own backyard. This weather station uses patented Self-Calibrating Technology to provide your personal forecast of 12 to 24 hour weather conditions. Self-Calibrating Forecasting is generated from weather data measured by a sensor in your yard, giving you the most accurate forecast available for your exact location. 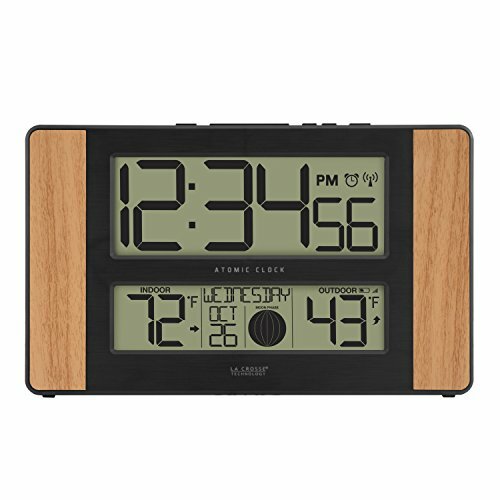 The bold, easy to read LCD screen includes indoor/outdoor temperature with daily high/low readings, and an atomic clock and calendar. 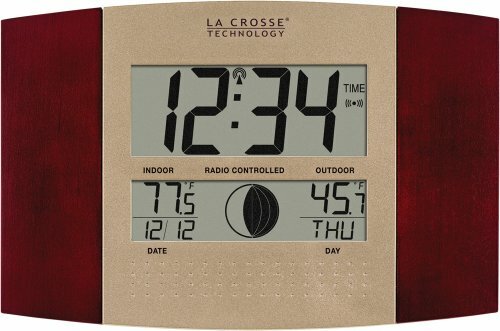 Atomic clock and calendar are radio-controlled to maintain the correct time and date with split-second precision, and automatically adjust for daylight saving time (DST). Display stands upright for tabletop use or is wall-mountable. The outdoor sensor features powerful wireless technology, low battery indicator light, and an integrated hanger for easy mounting. Weather station display is powered by 3 AA alkaline batteries (not included). Wireless sensor is powered by 2 AA alkaline or lithium batteries (not included). Lithium batteries recommended for use in outdoor sensor for temperatures below –4 degrees Fahrenheit (-20 degrees Celsius). One-year limited warranty. It's more than accurate, it's AcuRite. This metal clock is just as at home indoors as it is out. Constructed of metal this clock is weather resistant for ourdoor use. Radio controlled clock technology. A Fahrenheit thermometer has been added allowing this model to do double duty as a thermometer. 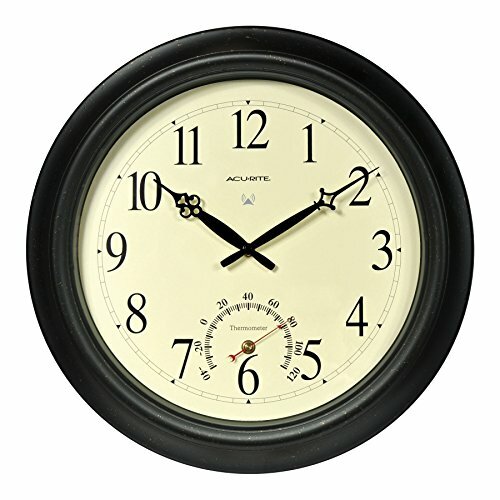 This clock features atomic time and precise, reliable temperature readings. 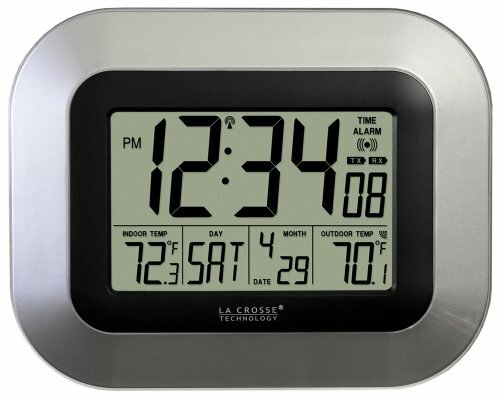 Atomic clock is radio-controlled to maintain the correct time with split-second precision, and automatically adjust itself for daylight saving time (DST). Durable, weather-resistant copper metal construction is suitable for all seasons, allowing indoor or outdoor use. Includes an integrated hang hole for easy wall mounting. One-year limited warranty. It's more than accurate, it's AcuRite. Manual Set Quartz time movement. Analog Temperature (F/C). Analog Hygrometer (%RH). Simple Operation: Insert 1 AA Alkaline Battery. Indoor/Outdoor use. Temperature Range: -10 F to +130 F(-23 C to +50 C). Humidity Range: 1-percent to 99-percent (%RH). 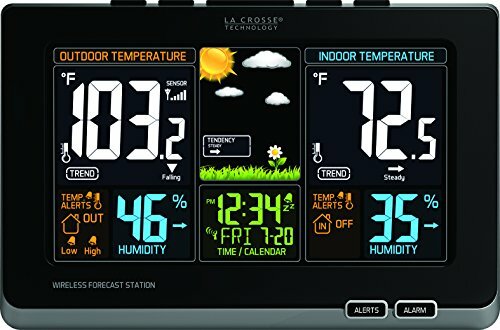 Full color display gives you current temperatures & humidity, with a future forecast whether it could be sunny or rainy to snowy. Features accurate, self-set atomic time & date with automatic DST updates. Records min/max values and alerts you of extreme temperatures. Also displays your heat index and dew point. Will indicate of low battery and reception strength. Batteries required (not included.). 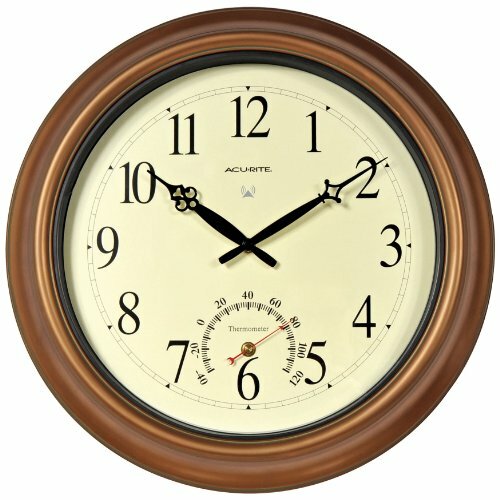 Compare prices on Clock Atomic Thermometer at ShoppinGent.com – use promo codes and coupons for best offers and deals. Start smart buying with ShoppinGent.com right now and choose your golden price on every purchase.